These are four recent paintings by Margaret O’Tool. These paintings were painted during 2016 and depict some of the bird she sees regularly as she walks on some of the beautiful walking paths close to her home on the Central Coast of New South Wales, Australia. 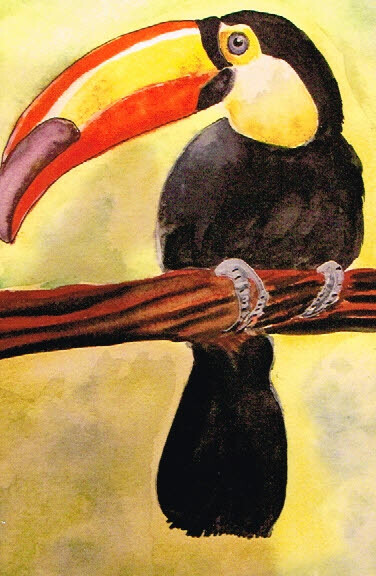 There are about 40 species of Toucan. They can be as big as 24 inches or as small as only 7 inches. They have short thick necks and their becks are large and have serrated edges to tear of pieces of large fruits. They also like berries. Small bird and lizards also are part of their diet. Ecologist say that they are important to the rain forests because they help spread seeds throughout the forest. This is a water-color painting by Margaret O’Toole. The artist says she saw many of these beautifully colored birds during her visit to Honduras as their habitat extends to Central America. Also called the rabbit eared bandicoot. 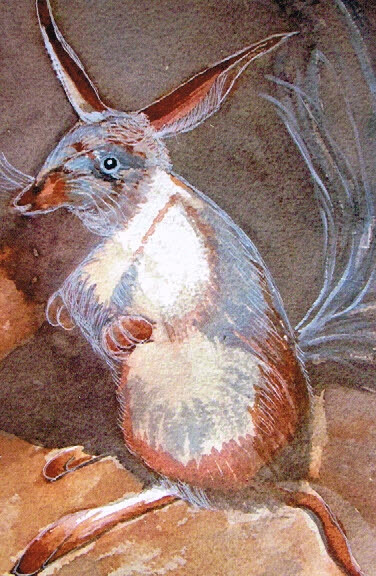 It has silky blue-grey fur, a long white-tipped tail and is about the same size as a rabbit. It moves with a graceful gait holding its tail high like a banner. Bilbies are found in the deserts of central and western Australia. They escape the heat of the day in deep cool burrows which they dig with their powerful front feet. They come out at night to feed on insects, seeds and small fruit. This is the Wadalba Warrior. A bird that has gained the admiration of a town. A town called Wadalba. Wadalba it located in the Central Coast of New South Wales Australia and is the home of this magnificent bird. 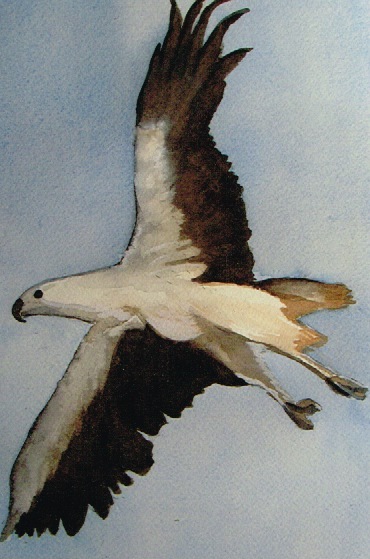 The artist painted this sea eagle (copied from a photo on the white bellied sea eagle site on the internet) the reason for this water-colour painting is because there has been a battle over a housing development project on southern Wadalba Hill on the Central Coast of NSW. There is a white bellied sea eagles nest on a tree at the edge of a clear felled forest. The chicks were inside and the site was clear felled nearly up to the tree. The parents have been back every day to feed the chicks despite the clearing and destruction going on nearby. There is an international protection agreement between China/Korea and Australia for this beautiful eagle. For years these eagles have been nesting at Wadalba Hill. A community environmental group calling themselves “Camp Eagles Nest” have been camping at the bottom of the hill nearby at the side of John’s Road for several months to gather signatures to save the eagle’s nesting tree. So far they have been successful. When I saw these pets Margaret had lovingly painted I was unperturbed. But on closer study of the paintings I realised that she had captured to essence of the pet she had painted. Many of these pets she has painted are family pets of a son or friend and Margaret has known these animals for some time in some cases. Some of these pets have died since she painted them. Some are very old and you can see this in their eyes and posture. Hope you see these paintings throughout the eye of the artists. One of my passions is taking photographs of animals and birds.Taking photographs and finding a great composition is often a fluke when taking birds. I have the fortune of having a very versatile camera, one that can zoom into a target and snap away giving close up shots of the birds, but the bird has to be posing in the right way. An artist on the other hand can be choosy about the composition of the painting and choosy about the photograph they might use. The photograph has to hold some attraction to them for them to spend time working for several hours on their work. Although artists can have the skills to copy exactly the photograph, I believe that good artistry is the ability to interpret the photograph. By using the photograph as an inspiration often a much more emotionally effective work results. This is what I believe Margaret has done with this photograph of mine. I was fortunate enough to find this Australian Darter in a pose drying his wings. Have you ever heard the expression, ‘like a shage on a rock’, well now you have seen one. This expression usually is said when someone is dripping wet. The Australian Darter dives into the water, wings swept back to hunt for fish similar to a cormorant. I have seem them while kayaking on a nearby river to my home doing just that or sitting on a branch over the water or on a rock drying out. 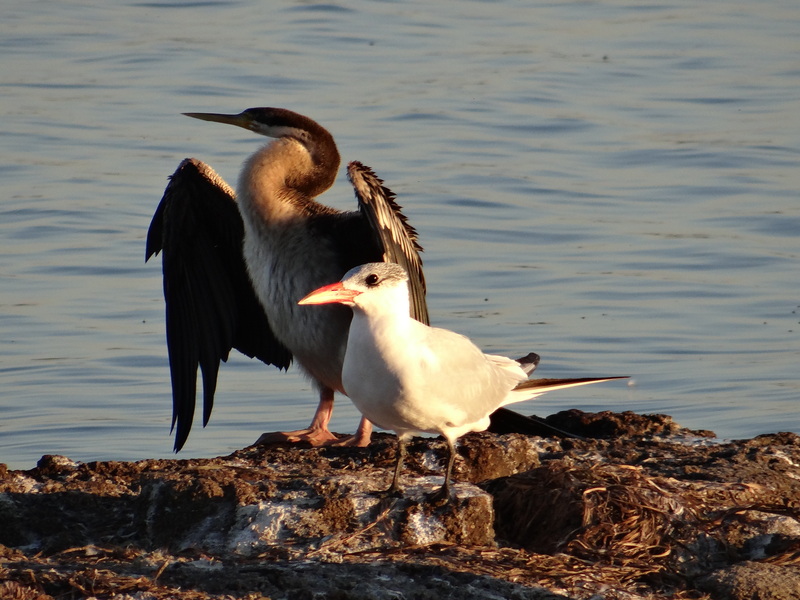 The other bird is a Caspian Tern. This one is non breeding, but during breeding season the bird has a black cap of feathers on its head. It would be the biggest tern in Australia at 53 cm long for an adult and like all terns swoops and drives for fish. 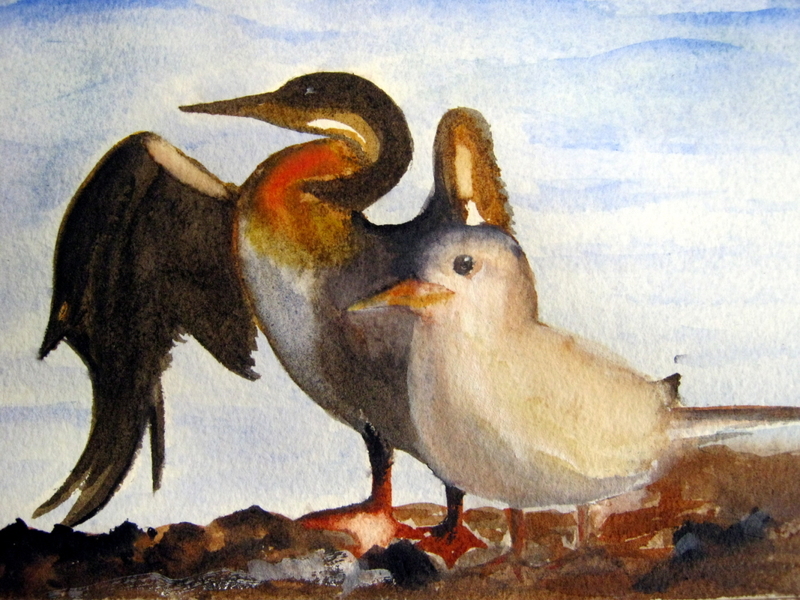 Margaret’s interpretation of the birds has softened the look of the two birds in such a way as to make them feel as though they would be excellent cute and cuddly pets. They are sitting on the rocks on a large salt water lake enjoying each others company. She said the paining was a bit of a challenge in that she found that the paper she was using soaked up the paint more than she expected, perhaps giving this softer look.